I’ve had lots of seafood gumbo in my day, and I’ve made more than a few. But nothing has blown me away like the version I ate at Peche, a New Orleans seafood restaurant run by Chef Don Link. 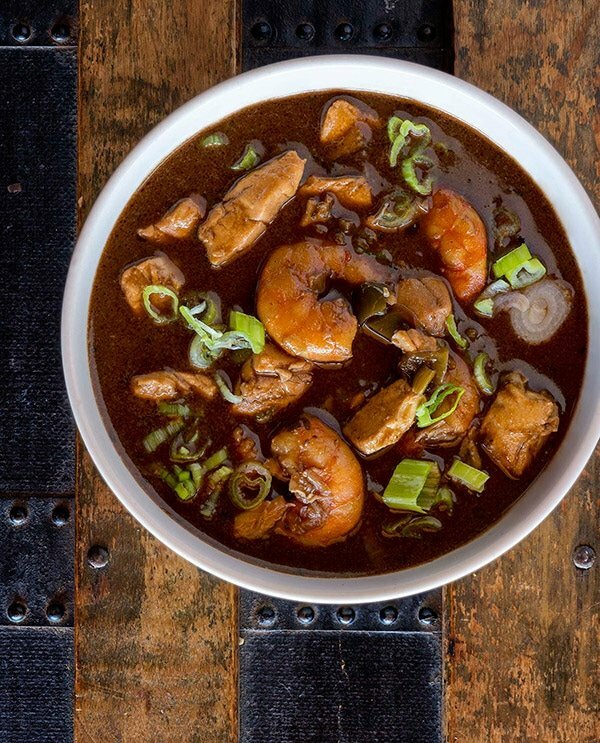 Where most seafood gumbos revolve around a peanut butter-colored roux, include tomatoes, are lighter and feature okra, Link’s gumbo had its shrimp and crabs swimming in a classic “dark chocolate” Cajun roux, no tomato at all, and was thickened with file powder. The effect is heartier, darker, like a squall roaring over Lake Pontchartrain, but everything in the bowl points to the seafood. It was less like eating a soup than it was like eating seafood with a gumbo sauce. This gumbo was a revelation. It was so much better than any others I’d ever had. I couldn’t stop thinking about it. I needed the recipe.
. As I suspected, this seafood gumbo hinges on great broth and a serious roux. And, of course, great seafood. Chef Link uses crab, shrimp and oysters. I’d just returned from down South, laden with Gulf shrimp and fish. I’d smoked some tripletail throats (belly+collar), and, when flaked out, tasted almost exactly like crabmeat. They’d go into the gumbo in place of the crab. I’d also just come home from a San Francisco Bay fishing trip, so I had some fresh halibut, too. All three would go into this gumbo. You can use any combination of fish and seafood, but you really need at least shrimp in there to go along with whatever fish you choose. And please get Gulf shrimp, or at least American shrimp. It makes a difference. Making shrimp or crab broth is pretty easy, and doesn’t take hours and hours like a regular stock does. So you can make it in the morning as you’re getting ready to make the gumbo. Or you can make your broth up to a few days before — do not use store-bought fish broth or clam juice. Homemade fish stock works great, too. Or throw it all in together, which is what I did. Now comes the only hard part of this recipe, the roux. There are lots of ways to make a roux, but I prefer the traditional method of mixing flour and oil or fat in a pot and stirring over medium heat until it’s ready. How long? As Chef Emeril Lagasse likes to joke, “three beers.” He’s right. 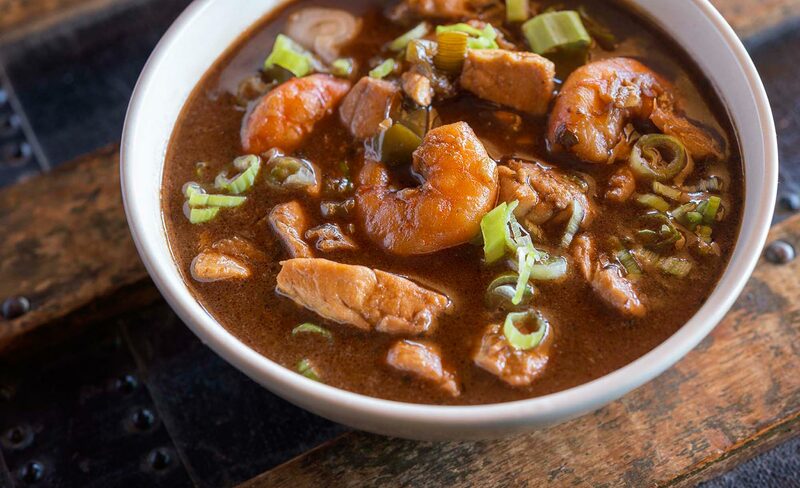 To get a roux dark enough for this seafood gumbo, you need almost an hour of almost constant stirring. (Here’s a short Instagram video of what it’s supposed to look like when you’re ready.) It’s the price you pay for magic. online. Other than that, this is an easy gumbo you can make with any fish and seafood you have lying around. This recipe makes a lot of seafood gumbo, so you’ll likely have leftovers. It reheats beautifully for a few days afterwards (store the leftovers in the fridge, of course). And it freezes well, too. 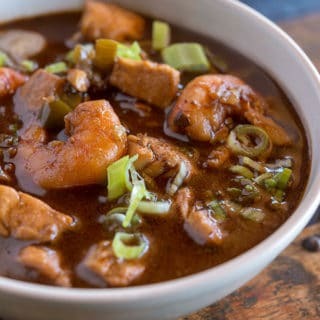 This is a rich seafood gumbo that can be made with whatever combination of seafood suits you. I'd choose shrimp and/or crab, plus some fish. Smoked fish or smoked oysters is a good choice. too. You need to make a broth for this recipe. 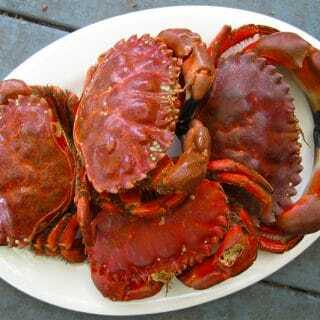 Use this crab broth recipe, adding fish bones or shrimp shells to it if you have them. Heat the seafood broth in a pot. You want it steaming, not simmering. In another large soup pot, heat the oil and bacon fat over medium-high heat. Stir in the flour and make sure there are no lumps. Cook this roux until it is the color of dark chocolate, which will take anywhere from 40 minutes to an hour. You will want to use a wooden spatula or spoon to stir. You will also want to lower the heat as the roux browns, until its at low heat when the roux is ready. Drink beer and listen to Cajun music while doing this. It helps. When the roux is ready, add the chopped onion, pepper and celery to the pot and mix well. Cook this, stirring often, for about 5 minutes. Stir in the garlic powder, paprika, chili powder, pepper, oregano, cayenne and celery seed. Ladle in some seafood broth and mix well. Turn the heat up to medium-high, and keep stirring in the seafood stock until the gumbo thins out. Typically you will need anywhere from 6 to 9 cups. Add salt to taste and simmer gently for 30 minutes to an hour, stirring from time to time. The roux should not break, but if oil starts pooling on the surface of the gumbo, skim it off. Add all the seafood and the file powder. Simmer this gently for 15 minutes. Add salt and hot sauce to taste and serve, garnished with the green onions, along with some rice or potato salad. If you don't have bacon fat lying around, just use 1 1/2 cups of peanut oil. You can find all kinds of recipes for all varieties of seafood right here on Hunter Angler Gardener Cook! This gumbo not only freezes well, the roux does too, and since it’s just as easy to make a triple batch, why not. Just remember the ratio of roux to stock. Too much roux and you get closer to etouffe than the really good soup stage that Hank is after.